ARCONA's Starter Kit for Normal Skin is a five-piece collection combining everything you need to experience a smooth, clarified and younger-looking complexion. Carefully curated, the collection forms 'The Basic Five'; the brand's recommended skincare regime for achieving beautiful skin. An enzymatic exfoliant that effectively cleanses, tones and refines skin to promote a smoother, brighter-looking complexion. Natural Yellow Corn and Oatmeal exfoliate, while a blend of Retinol and Glycolic Acid (5%) purifies pores and clarifies the appearance of skin. Smoothing and revitalizing, the exfoliator will help strengthen the skin's natural barrier with Aloe and Vitamin E. Skin is left feeling soft, smooth and renewed. 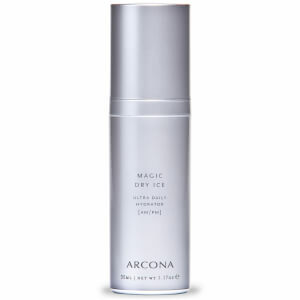 An intensely hydrating, anti-aging lotion that moisturizes dry skin while delivering antioxidant protection. Safeguarding skin from damaging external aggressors, the moisturizing solution contains a blend of Olive Fruit, Squalane and Raspberry Seed Oils to help replenish moisture and reduce the appearance of wrinkles. Brightening and protective, the hydrating lotion will leave skin feeling smooth, fortified, replenished and radiant. A protective mist that delivers a shield onto skin to keep it safe from external aggressors such as pollution and harsh weather. Creating a protective barrier, the mist seals in moisture and contains natural humectants Sodium PCA and Glycerin to ensure optimum hydration. Helps repair and strengthen skin's collagen and elastin for visible results on dry or aging skin. An antioxidant-rich facial cleanser that effectively lifts away dirt and impurities while refreshing and refining the appearance of skin. The purifying face wash contains antioxidant White and Green Teas to calm and protect, plus a dose of Cranberry Enzymes to help nourish, clarify and strengthen the skin. It cleanses and tones, refining the appearance of pores, and maintains skin's natural pH balance with Yucca, Vitamin E and Aloe extracts. A night-time treatment specially formulated for dry, sensitive skin. Performing deep exfoliation while you sleep, the formula helps to renew and regenerate the complexion, repairing sun damage and resurfacing the skin as you sleep. Its high powered antioxidant complex protects against external aggressors, while a blend of Algae, Amino Acids and Chlorophyll nourish. Pores appear refined and skin witnesses renewed smoothness and clarity. Step 1: Exfoliate/Cleanse - Place 1/2–1 teaspoon of exfoliating gommage in the palm of hand. Add a few drops of water, then mix and apply to damp face, neck and décolleté. Gently exfoliate, then rinse. Use gommage every other day. On alternate days, use White Tea Purifying Cleanser as specified in step 4. Step 2: Hydrate - After cleansing, apply a thin layer of Magic Dry Ice to face, neck and décolleté. Leave on skin. Step 3: Protect - Shake bottle. Spray Desert Mist sparingly into palm of hand and then evenly distribute over entire face. Include eye area, lips, neck and décolleté. DO NOT SPRAY DIRECTLY ONTO FACE! May be diluted with a few drops of water for thinner consistency. Step 4: Cleanse/Tone - Use daily. Apply cleanser to wet face with light, upward and outward circles. Rinse well. Step 5: Regenerate - After cleansing, apply The Solution to face, neck and décolleté with upward and outward circular motion. Use 2–4 times a week. On alternate nights, for dry skin, may use Magic Dry Ice as in Step 2 above. Exfoliator: Aqua (Water), Zea Mays (Yellow Corn) Kernel Meal, Avena Sativa (Oat) Kernel Meal, Stearic Acid, Glycolic Acid, Glycerin, Olea Europaea (Olive) Fruit Oil*, Tocopheryl Acetate (D-alpha), Aloe Barbadensis Leaf Juice Powder*, Citrus Limon (Lemon) Peel Oil, Retinol, Prunus Amygdalus Dulcis (Sweet Almond) Oil*, Allantoin , Althaea Officinalis (Marshmallow) Root Extract, Chamomilla Recutita (Matricaria) Flower Extract, Daucus Carota Sativa (Carrot) Root Extract, Cetearyl Alcohol, Cetyl Alcohol, Glyceryl Stearate, Gluconolactone, Sodium Benzoate, Benzyl Alcohol, Alcohol. * Denotes Organically Sourced. Hydrating Lotion: Aqua (Water), Caprylic/Capric Triglyceride, Glycerin, Cetearyl Olivate, Saccharomyces/Xylinum/Black Tea Ferment (Kombuchka™), Cassia Alata Leaf Extract (DN-AGE®), Ethoxydiglycol/Hydroxycinnamic Acid (Lipobrite®HCA), Diacetyl-Boldine (Lumiskin™), Sorbitan Olivate, Squalane, Melaleuca Alternifolia (Tea Tree) Leaf Oil, Isodecyl Neopentanoate, Pancratium Maritimum Extract (Clari-NET), Humulus Lupulus (Hops) Strobile, Citrus Grandis (Grapefruit) Peel Oil, Tocopherol (D-alpha), Helianthus Annuus (Sunflower) Seed Oil, Aloe Barbadensis Leaf Juice Powder, Phytic Acid, Potassium Sorbate, Hydroxyethylcellulose, Lonicera Caprifolium (Honeysuckle) Flower Extract, Lonicera Japonica (Honeysuckle) Flower Extract, Caprylyl Glycol, Carbomer, Phytic Acid, Phenoxyethanol, Sorbic Acid, Xanthan Gum, Sodium Hydroxide, Fragrance (Natural). Mist: Aqua (Distilled Water)m Hamamelis Virginiana (Witch Hazel) Extract, Glycerin*, Alcohol, Sodium PCA, Tocotrienols (Vitamin E), Zeolite, Ascorbic Acid (L), Glutathione (L), Deuterium Oxide (Heavy Water), Selenium, Acetyl Cysteine, Origanum Majorana (Marjoram) Leaf Oil. Cleanser: Aqua (Water), Butyrospermum Parkii (Shea) Butter, Decyl Glucoside, Glycerin, Sodium Lauroyl Lactylate, Camellia Sinensis (White Tea) Leaf Extract, Yucca Schidigera Root Extract, Tocopheryl Acetate (D-alpha), Rubus Idaeus (Raspberry) Fruit Extract, Vaccinium Macrocarpon (Cranberry) Fruit Extract, Citrus Grandis (Grapefruit) Peel Oil, Rubus Idaeus (Raspberry) Seed Oil, Ananas Sativus (Pineapple) Fruit Extract, Citrus Limon (Lemon) Peel Oil, Citrus Aurantifolia (Lime) Oil, Sodium Chloride, Mangifera Indica (Mango) Fruit Extract, Cocamidopropyl Hydroxysultaine, Fragrance (Natural). Night Treatment: Aqua (Distilled Water), Glycerin*, Glycolic Acid , Hamamelis Virginiana (Witch Hazel) Water, Phenyl t-Butylnitrone (Spin Trap), Glucosamine HCI (D), Fructooligosaccarides (D-beta), Yeast, Lavandula Angustifolia (Lavender) Oil, Alcohol * Denotes Organically Sourced.